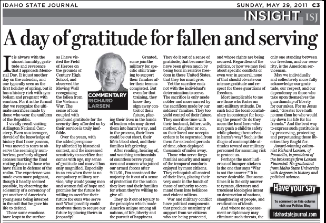 It is always with the utmost humility, gratitude, and reverence that I approach Memorial Day. It is just another day on the calendar, and one typically seen as the first holiday of spring, but has a history rich with symbolism and pregnant with emotion. For it is the formal day we recognize the ultimate sacrifices made by those who wear the uniform of the Republic. I vividly recall visiting Arlington Memorial Cemetery. Even as a teenager, devoid of the knowledge of history as I now possess, I was moved to tears to observe the seemingly numberless, perfectly aligned crosses marking the final resting places of those who have fallen in defense of the realm. The experience was made even more poignant, though it hardly seemed possible, by observing the solemnity of a ceremony of yet another of America’s young sons being interred in the soil that he gave his life to defend. Those same emotions have lept to the surface as I have visited the Field of Heroes on the grounds of Century High School, and observed the traveling Wall recognizing the fallen from the Vietnam War. The sense of loss, coupled with profound gratitude for the security they afforded us by their service is truly ineffable. Over the years, with the added perspicacity afforded by historical context, and the increased sensitivity to sacrifice that comes with age, my sense of gratitude and marvel has only magnified. Especially in an era when there is no compulsory military service, why would young men and women full of hope and promise for the future be willing to sacrifice their future, for ours, who serve not? What possibly could motivate them to secure our future by placing theirs in jeopardy? Granted, some join the military for specific skill training to support their families after their term is completed. But even for that training, they know they sign away control of their future, placing their lives in the hands of leaders who may direct them into harm’s way, and in the process, their lives cut short, their life’s blood shed, and their families left grieving. After reading, hearing of, and watching testimonials of countless brave young men and women who joined our armed forces ranks after 9/11/01, I’m convinced the majority do it out of a sense of protection for the nation they love and their families for whom they’re willing to give all. They do it out of loyalty to the principles which made America unique among all nations, of life, liberty, and the pursuit of happiness. They do it out of a sense of gratitude, that because they have been given much by being born in relative freedom in these United States, that they too must give. Yet the sacrifice ends not with the individual’s determination to serve. The sacrifice is only made nobler and more sacred, by the sacrifices made by our soldiers’ families. They yield control of their future. They sacrifice time with their husband, father, wife, mother, daughter or son, as they accept orders to be separated from loved ones for extended periods of time and often thousands of miles apart. They forgo familial security and many of the temporal comforts enjoyed by most citizens. They relinquish all control of their lives, placing their very soul in the hands of those of authority to command them into bellicose and violent milieus. War and military conflict have political components that preclude unanimity of support from we citizens who are being protected, and whose rights are being secured. Regardless of the politics, or how we may feel about specific conflicts or even war in general, none of that should obviate our intense gratitude and respect for these guardians of freedom. Most inexplicable to me are those who foster an anti-military attitude. Do such hold the local constabulary in contempt for keeping the peace? Or do they scorn the local hero who may push a child to safety while placing themselves in harms’ way? Such is the illogic of contemptible attitudes toward our military personnel for assuming risk to protect us. Perhaps the most ludicrous of bumper stickers is the one that says “War is not the answer.” It is never desirable. But sometimes it is the only answer to tyrants, dictators and truculent ideologies intent on destruction of nations, slaughtering of people, and eradication of ideals. And where no appeasement or diplomacy may eliminate such threats, the only one standing between our freedom, and our security, is the American serviceman. May we individually and collectively more fully acknowledge our gratitude, our respect, and our dependency on those who take upon themselves the guardianship of liberty for our sakes. For as Jesus said, “Greater love hath no man than he who would lay down his life for his friends.” And the best way to express such gratitude is by preserving, protecting, and perpetuating those liberties they fought for.